Set Up with a St. Croix seat and folding helm with nav lights this boat is turn key ready for the next adventure. 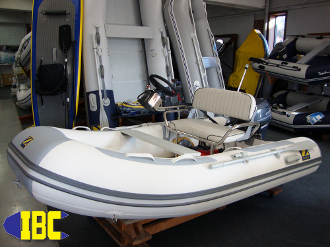 Zodiac RIB featuring CSM-Hypalon fabric and a reinforced fiberglass transom. This model features a heavy duty 2 piece fiberglass deck as well as an integrated bow locker. This boat also has a fiberglass bench seat and two seat positions as well as oars, foot pump, large self bailing drain, lifting eyes and d-rings, integrated hand holds. If you are looking for a true Hypalon rigid hull inflatable and want to keep the weight down, don't miss this one!